If you are raising cattle, then calving date is the single most important choice you can make for your cow/calf herd because of the enormous impact it has on your entire beef operation. In this article I am going to teach you how to choose the perfect calving schedule for raising cattle for grass-fed beef production. I will show you how calving during the growing season allows you to perfectly match your cattle nutritional requirements to the changing nutritional quality of your pastures throughout the seasons. And I will explain why calving during the growing season is the ONLY way that a cow/calf herd can safely participate in a cost-saving winter grazing program without risk to their cattle health or beef cattle fertility. No matter where you are raising cattle around the globe, the best time to calve is always during the growing season and after the cows have had time to fatten up to a body condition score of 7 on growing pasture. This calving schedule is typically known as summer calving, though the actual date will vary according to the seasonal differences of each local climate. The rule of thumb is, calve when the wild grazing species - the deer, moose, antelope, or wildebeest - calve in your area. That is the most ideal and most efficient calving date that you should also use when raising cattle. Beef cattle fertility in the next breeding season is maximized because the cows have time to fatten up prior to calving. The high energy demands of providing milk for the calves is easily accomplished on the summer's lush grass growth. In fall, as the grass quality deteriorates, lactation reduces until the cows naturally wean calves to conserve energy. And the new growing season begins shortly after the energy demands of pregnancy become noticeable during the cow's third trimester. FACT # 2: The quality of your winter pastures begins to deteriorate from the moment that the growing season ends. If you prepare your pastures for winter grazing it will dramatically reduce the rate of pasture deterioration so your winter pastures last longer. Nonetheless, it is an inevitable fact that your cattle's weight gains will slow down or even stop altogether as your cattle tap into body fat reserves to supplement the deteriorating pasture quality over the course of the winter. How much body fat the cattle will lose during the winter, whether their body condition remains within safe limits, and whether your herd can continue to graze safely throughout the full length of the dormant winter grazing season all depends on how much nutrition the cattle need during the winter to meet all their nutritional needs. FACT # 3: Cattle nutrition requirements are not set in stone. You have a large degree of control over your cattle's nutritional requirements during the winter by changing the timing of your cattle's calving season. Maintenance - the basic day-to-day cattle nutrition required to survive and stay warm at any given time of the year. Growth - the nutrition required for healthy bone and muscle growth - this category only applies to growing cattle that have not yet reached maturity. Pregnancy - the extra nutrition required to grow a foetus. The nutritional demands of pregnancy are fairly insignificant until the final three months of pregnancy when your cattle's nutritional requirements suddenly balloon upwards. A cow that calves during the growing season will be able to meet a large portion of her ballooning nutritional needs during this last trimester on cheap growing pasture whereas a cow calving in the more conventional early spring or late winter calving cycle will need to rely on expensive cattle feed during the winter to meet the nutritional demands of pregnancy. 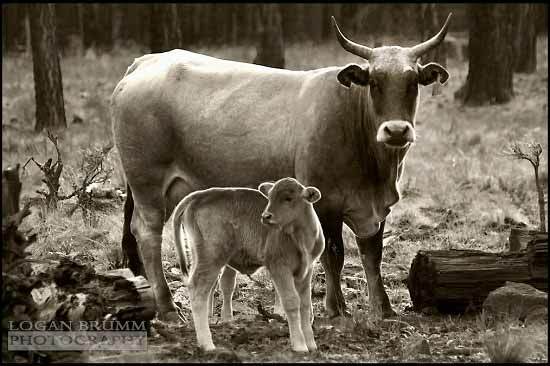 Lactation - the extra nutrition that a cow requires to produce milk for her calf. When the calving season is timed to coincide with the growing season, the abundant, cheap, growing pasture is able to supply the HUGE spike in nutrition that cows need once they begin producing milk. But when calves are born in late winter or early spring before the growing season has begun, this huge jump in your cows' nutritional requirements cannot be met by the deteriorating winter pastures and must be supplied through expensive cattle feed. That's why wild grazing species (deer, moose, bison, wildebeest, etc.) all time their calving seasons to coincide with the growing season when grass is the most nutritious and most abundant. Fertility - the nutrition required to convert the cow's body back to oestrus cycles after pregnancy. When a cow calves, all her excess energy reserves are redirected towards producing milk for her calf. If she is not already nice and fat (BCS of 7) by the time she calves, her body will prioritize the energy she receives from her feed intake towards milk production for her current calf and towards gaining sufficient body fat to prepare herself for the upcoming winter. Future fertility takes a back seat to making sure that (1) the cow is fat enough to prepare herself for the next winter and (2) that the cow is fat enough so she can continue producing milk for her current calf later in the year after the growing season ends and the pasture quality begins to deteriorate. This means that cow fertility in the upcoming cattle breeding season will suffer if your cows haven't already regained a BCS of 7 before they calve. Only if the cow has already regained a BCS of 7 by the time she calves will there be enough energy left over for the cow to maximize her fertility in time for the upcoming cattle breeding season. This is a basic survival mechanism that prioritizes the survival of the cow first, the survival of her current calf next, and only if both of these are fully addressed will the cow's body maximize her chances of getting pregnant again. Future potential is only possible if the present needs are accounted for. Raising cattle to calve in winter means that this newborn calf, and its mother, have all the nutritional odds stacked against them and cannot participate in a winter grazing program. If you are raising cattle that are scheduled to calve in the late winter or early spring, you cannot safely extend your winter grazing season through the entire winter. Period. In a late winter or early spring calving program, your cattle's nutritional demands are simply too high outside of the growing season to (1) stay warm and healthy, (2) grow a healthy foetus during the last three months of the pregnancy, (3) provide milk for the newborn calf, AND (4) still be able to address cow fertility in time of the next cattle breeding season. There simply isn't enough nutrition in the dormant winter pastures to provide for all four of these nutritional needs. If you are currently raising cattle using a late winter or early spring calving season, then you cannot risk letting your cattle lose body fat over the winter without compromising your cows' fertility and without risking the health of both cow and calf. If you use a late winter or early spring calving season, you cannot allow your cattle to lose body condition in the winter, period. Consequently, you miss out on both the cost-savings of winter grazing and the cost savings of compensatory gain. If you are raising cattle to calve anytime outside of the peak growing season then you cannot safely extend your grazing season past the end of autumn and you must rely on expensive stored feed to provide for your cattle herd during the winter months. Go fix your calving season schedule before you even think of extending your winter grazing season through the entire winter. The grass-fed solution... Calve in late spring or early summer (after the growing season is well underway) so your cows have time to fatten up on lush spring grass before they calve. When you calve during the growing season, the timing of your cattle nutrition needs mesh perfectly with the changing nutrition available from your pasture throughout the year. This will greatly reduce the expenses associated with raising cattle and allows your cow/calf herd to participate in your winter grazing program. They still need to keep warm during the winter(maintenance). But, cows have the luxury of weaning their calves at any time during the winter (with or without your intervention) to safely reduce their nutritional demands without any risk to their calves, which are more than old enough by the winter to safely survive without milk (minimal to zero lactation). Cows have fresh growing grass during the last month of their pregnancy (pregnancy demands are near zero until mid to late spring). And cows are able to fatten up on growing grass before they calve so fertility is not compromised during the next cattle breeding cycle (fertility demands are addressed during the growing season, before calving starts, rather than during the winter). Raising cattle to calve during the summer means that this newborn calf, and its mother, have all the nutritional odds stacked in their favor. Nature figured out the most energy-efficient calendar for raising cattle. The wild grazing species rely on this same efficient production calendar. Follow nature's lead by scheduling your calving season to coincide with the calving season of the deer, moose, antelope, or whatever other wild grazing species dominates your area. That gives you pretty clear date range for timing your calving season. It takes approximately 3-weeks to one month to fatten your cows and heifers on the lush spring pasture from a Body Condition Score (BCS) of 5 to 7 (the safe BCS range). Your calving season should be timed to allow for this body condition increase before calving starts. And your calving season schedule should leave a bit of a buffer to account for a late spring so your cows have time to fatten up before they calve even if spring is a bit later than usual. For example, the region where I live in Canada can reliably count on having good spring grass growth between the 1st and the 10th of May even during a very cold, late spring. Consequently, the ideal calving season in this area should start around June 9th to give the cows a solid month on grass to fatten up before calving, even during a cold late spring. Unsurprisingly, this date is right around the same time that the deer start fawning in our area - the deer start fawning anytime between the 27th of May and the 10th of June (it varies somewhat from year to year). When raising cattle in equatorial regions, your growing season (and calving date) will be determined by the seasonal cycle between rainy season and drought season, the nutritional equivalent to summer and winter in more northern climates. Further from the equator your growing season (and ideal calving date) will be determined by temperature and moisture availability in the soil as the seasons shift from summer to winter and back to summer again. If you have any doubts about your ideal calving date, watch the wild grazing species in your area for clues. To learn more about how to calculate the timing of your ideal calving season and to learn about the huge impact that photoperiod (length of daylight during the cattle breeding season) has on your cattle's fertility, I recommend that you read "The Cattle Year on Grass" chapter of Grass-fed Cattle. The bottom line is that in order to match your cattle's nutritional requirements to the grass quality and quantity in your pastures throughout the seasons, you must calve during the growing season, after the cows have had time to fatten up to a BCS of 7 on the growing pasture. This calving cycle will greatly contribute to your cattle's health and fertility throughout the year, will save you huge dollars in cattle feeding costs, and will allow your herd to safely participate in a winter grazing program to reduce feed costs still further. In some equatorial regions where moisture is high year-round there may be no distinct growing season / drought season cycle. If grass growth is fairly uniform throughout the entire year, then you have the luxury of picking any calving season of your choice for raising cattle. However, watch what the wild grazing species are doing - if they also calve year-round then you can safely do the same with your herd. But if they are using distinct calving seasons then you should too because this signals that there is a distinct advantage to calving at one time of the year over another, even if that reason may not be immediately obvious to you (i.e. parasites, predators, nutritional changes in the grass, etc). Always follow the lead of the wild grazing species in your area when choosing a date for your calving season. 42-Day Cattle Breeding - Why raising cattle using a 42-day breeding season is an essential grazing management strategy. The Benefits of Calving on Pasture - Learn about the many advantages of calving on pasture during the growing season. Lifelong Beef Cattle Fertility - How calving date, pasture nutrition, and body fat during adolescent sexual development affect the fertility of your future breeding stock for the rest of their adult lives. 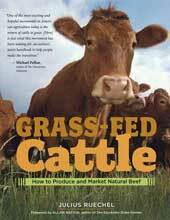 Raising Cattle on Grass - Learn how to prepare your cattle herd for your grazing conditions.